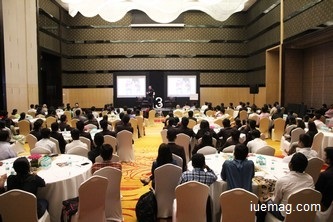 An event so grandiose with a place to match, a world leader so epic with a host to match; November 29th, 2015 witnessed Chris Arnold at J.W.Marriott, hosted by I3, connecting him to the youth of Bengaluru and around. What unfolded was an event of magnificence, read more to learn about it! A platform that was established just 24 months ago recently hosted Chris Arnold at J.W.Marriott, Bengaluru; one of the most phenomenal venues the city boasts of; and what a fantastic event it was! Before I talk about the big day that November 29, 2015 was, allow me to introduce i3 to you. i3 (Inspire, Influence, Impact) is a vision of Mr. Sujit Lalwani to influence & inspire the youth to be able to create a sustainable impact across the globe. The i3 conferences are nothing short of phenomenal, with the counselor panel boasting of people like Ashok Shankar Rathod, Vanessa Picker, Chetan Yallapurkar, Chris Arnold, Michael Teoh and the like. i3's vision of creating strong social impact by connecting the youth to world leaders and the like has made it undoubtedly the best platform the country has to offer to the youth of today. 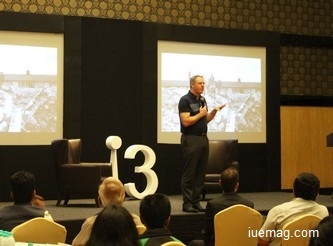 Even as the youth have gotten opportunities to be counseled by entrepreneurs, authors, engineers and luminaries who have traveled across the world, Nov 29th, 2015 saw Chris Arnold live in Bengaluru, hosted by i3. Chris Arnold, founder of Smaller Earth, and recently World Merit who is based in Liverpool is a world leader, an entrepreneur by the word and a global phenomenon. The event unfolded beautifully with Chris sharing his story- of where he came from, to where he has reached, to what influenced his huge success. He spoke of the importance of finding a mentor, of how travel can broaden perspectives and how resilience is perhaps the one key factor that has made him what he is today. Given that I have traveled quite a bit myself- across Germany, Malaysia, U.K, Cambodia and a few more places- his words were of great impact, for every time I travel, I come back with an enhanced perception of things. Not just about the importance of travel, even the other key things that Chris shared - about being resilient in your efforts, about letting other people be upset about you when you are doing the right thing, about not having any right to be impolite or disrespectful to your parents or teachers, about YOU being the most important person in your life were words of wisdom which the audience received with full enthusiasm. He then spoke about World Merit 360, which will consist of 360 people from across the world to solve global problems (17, to be precise and these are the United Nations Sustainable Development Goals such as to eradicate Hunger, Poverty, ensure Gender equality etc) and create immense social impact to the world as a whole, which expanded the horizons of thinking for every single person in the audience. The action plan to achieve the 17 goals will be presented at the United Nations. Sneha Chandrashekhar spoke about her initiative "WeRiseForHer" as part of the UN SDG for Gender Equality on the list of 17 goals mentioned above, and their work on it is commendable. Post that, GIBS management school welcomed Sir Chris Arnold on their advisory board. The huge impact on the students of the future batches that shall enroll into GIBS will definitely be greatly rewarding through this association. The audience were bowled over by Chris's modesty and his story telling. Talking about the audience demands me to mention what a star studded audience the event had, with directors, social entrepreneurs, people from the media, B-School students and more importantly, youth from across various backgrounds. A high tea that was served at the end of the session and networking time with all the stars in the audience where the youth could interact directly with Chris and others, marked the end of an event which propelled the youth who attended it towards massive action. There is no worship if there isn't a temple, there is no scope of action if there isn't a platform. None of this would've been possible without i3. Immense respect for the work they do, and immense gratitude for the bridges they are helping build across the globe. Cheers.